Since there is no cure for MS, health practitioners are always sourcing new physical therapies, treatment combinations, and medications to relieve the symptoms and help ease the burden of MS. Complementary therapy has earned a spot in modern medicine, and even centuries-old approaches like acupuncture may have a place in today’s MS management. As with most physical approaches to disease management, acupuncture brings some concerns, as well as hope. At best, it can have remarkably positive, almost immediate effects on movement and feeling, but there’s also the possibility of disappointment and complications. 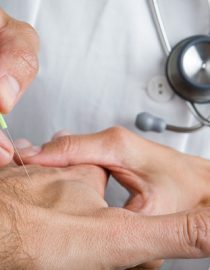 A better understanding of how acupuncture may work, what it involves, and how it measures up to scientific standards will help you decide if it’s the right therapy for your MS. Since acupuncture is an Eastern medicinal practice, the explanation behind it may seem unclear to Western sensibilities. However, what acupuncture experts see as a realignment of energy could be explained in scientific terms by the release of opiods to the nervous system, or changes in neuroendocrine function. It’s this impact on the nervous system that holds the most promise for MS patients, since MS is a neurological disorder. Acupuncture is a detailed approach that works the body in very specific ways. In general terms, acupuncture involves correcting the flow of energy through your body. The Chinese call this flow “qi”, and it travels through 14 pathways. When the flow is uneven or blocked, illness results. The acupuncturist uses special, thin needles at points along the 14 pathways to stimulate and adjust the energy flow. They are inserted into the skin and left for a period of time, but since they are extremely thin, you generally won’t feel a thing. This is a relatively new technique, and it’s been gaining ground in the holistic community over the past few years. Scalp acupuncture combines ancient Chinese needle therapy with Western knowledge of the brain to interact with the cerebral cortex; the aim is to interfere, adjust, or manoeuver the nerve pathways in a few different sections of the brain, which may relieve the neurological symptoms of MS. Advocates insist that scalp acupuncture is the most effective for MS. Some report drastic, almost immediate improvements – even one short session can bring noticeable results. In other cases, needling on the scalp is combined with regular body acupuncture, electroacupuncture, or moxibustion. Next page: evidence to support acupuncture, and risks, precautions and side effects.